EAHAE International Member: Blanca Llantada, Spain. 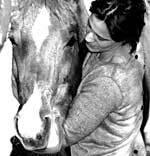 Blanca Llantada is the director and founder of the European Institute of Training with Horses whose goal is to advance the self-knowledge and personal development through work with horses. Formed in Natural Horsemanship, Horse Trainer Train Intangibles Program & Workshop Training Horse Coach, NLP and Coaching, among other disciplines, has extensive experience in leadership development and applied both personally and to the organizational. Currently plays in both his professional work in the field of training and personal growth and leadership in working directly with businesses and individuals to support them in the realization of an effective transformation in its system through the implementation of an effective methodology to process the change. Alongside this, is the director of The Akademia in Valencia. A selfless teen program through which receive more than 120 hours of training in self-awareness, personal development and leadership values.